I grew up in Kingston-Upon-Thames and moved to South East London in 1991 when I studied Psychology at Goldsmiths. I spent many years researching cognitive neuropsychology using functional imaging. In 2003 I moved to West Dorset where I now live with my 3 children, our dog and 4 cats. I have always created. As a child I was a prolific mini artist and writer. The power and malleability of colour, form and language has always obsessed me. I would spend hours creating complex fantasy and surreal images in pencil and writing poems that employed rich imagery. When I moved to Dorset I rediscovered the pull of colour and texture, creating many abstract pieces with thick acrylic applied to canvas with palette knives. Then I became transfixed with the pure colour and lines produced in pen and ink illustrations and created paintings with an art nouveau feel. At this time I had also began playing around with photographs that I took on my mobile phone using image manipulation applications such as PicsArt. I took photos of my illustrations and digitally manipulated them; constantly fascinated by the way that colour and feel could be altered with a few clicks of my phone. In August 2014 I shared exhibition space for Bridport Open Studios with photographer Nathalie Roberts. Seeing my love for digitally manipulated things she suggested I used photoshop. I signed up to Adobe’s Creative Cloud and researched resources, discovering (among others) Design Cuts and 2 Lil’ Owls. I taught myself some techniques and pretty much dived straight in! 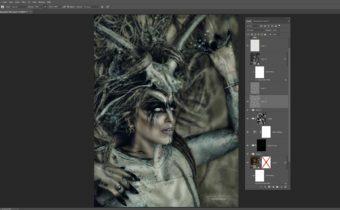 It was while I was on the 2 Lil’ Owls website that I saw an advert for Sebastian Michaels’ Photoshop Artistry Grunge Course. 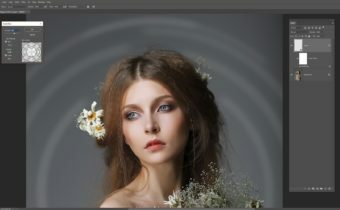 I signed up to the course and a couple of months later I joined Sebastian’s Advanced Photoshop, holistic, AWAKE course. I have not looked back! Photoshop allowed me to really put across feelings and emotions and other worlds in a way that I never thought I could. It is no exaggeration to say that it has truly changed the way I create and express myself. It is safe to say that everything inspires me. From the strangest of things to the more obvious: the colour that a door is painted in, the way the sea makes me feel, a book I have read, a film I have seen, something my children do, a leaf on the ground, the smell of perfume. When I moved to Dorset my perspective on the world shifted. I stopped to look, I heard things I would have ignored, I saw details in things I would have overlooked. I slowed down and became an observer; I saw beauty in the small things. Photoshop allowed me to really put across feelings and emotions and other worlds in a way that I never thought I could. It is no exaggeration to say that it has truly changed the way I create and express myself. I like a wide range of art. I love the work of Mucha, Rosetti, Waterhouse; the opulence and beauty of their subjects and work. The mathematical and surreal work of Escher fascinated and inspired me ever since my parents framed a print and hung it on our wall when I was growing up. To bend expectation and logic with art is fascinating. I love the surreal and fantasy work of HR Giger. The wide eyed whimsical art of the Bad Apple Artist Collective (with artists such as Tanya Bond and Anita Inverarity). The gorgeous and disturbing photography and digital art of Jennifer Rhoades, Eating Strawberries and Danielle Tunstall. The illustration and photo manipulation of Mario S. Nevado, Carlos Quevedo and Cindy Grundsten among many, many others. I often have the feeling that my work is merely a collection of images that were meant to be discovered in order to interact with each other; a story waiting to be told. For the most part I begin with an image and the process weaves itself intuitively. As I create it then becomes more obvious what the piece is trying to portray and other images, ideas or elements pop into my head. All of my work has a human element; every piece starts with an image of a person. As I stare into the starting image ideas of what to do next occur without me really having to think too closely about it. Saying that, I mostly have an idea of the type emotional response I want a piece to have. For me that is what my artwork is about; prompting a gut reaction. Revealing emotion and cognitive process. I am thinking of renaming myself Caroline Julia Multiply-Blend! I f I am stuck for whatever reason I will often merge and duplicate layers, stacking the same duplicated layer at different blends and opacities; my favourite being multiply. 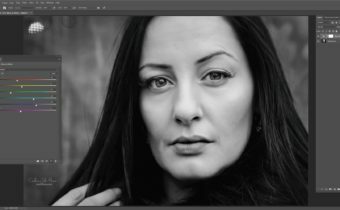 I love Topaz Clean for creating an illustrative, subtle unreal edge to portraits. I am also currently pretty obsessed with Corel’s Particleshop. I am proud of all of my work, for being what it is and was at the time. I am most proud of my work when someone messages me and tells me that my work has had an emotional effect on them. I am currently working on a series of images in collaboration with the Photographer Colby Files. We are putting together a book that will comprise shots of a photo shoot, raw unedited images, the final edited photograph and Digital Art composition. You can find out more at The Colby Files Blog. Photoshop art has the potential to unlock so many facets of imagination within you. Everything you can imagine that you would like to create you absolutely can. NIce to see you featured here Caroline. Great insight to CJM and her work and processes she goes through. Great admirer of her work as a fellow Awakener! Love your tutorials clear and not rushed, thank you. Also like the emotional impact that your pictures have.